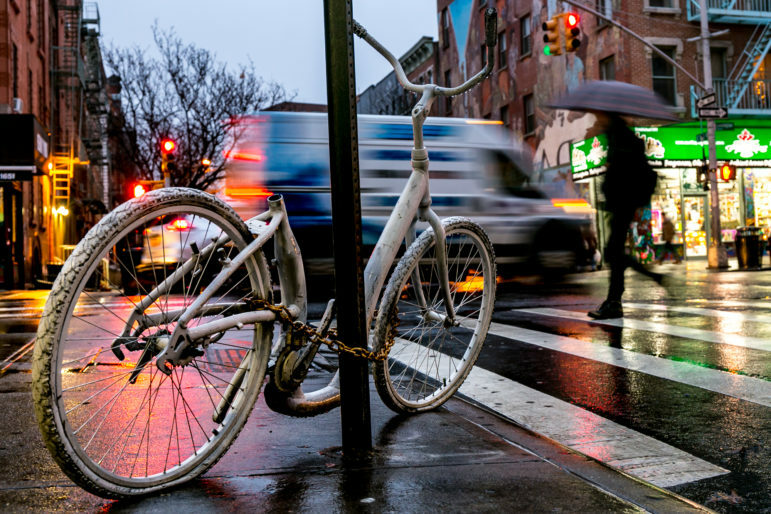 A Ghost Bike at the north west corner of Lexington Avenue and 104th Street memorializes a fatal crash on April 17, 2014. At 78 years old, Michael Schenkman rode his bicycle every day. The long-time Queens resident had an obsession with two wheels—from motorcycles to weird British bicycles, as his son recalled—and ran an automotive specialty repair shop in Flushing for over 20 years, along with teaching drivers education. He started running 10Ks at age 70, racking up a collection of trophies and ribbons. Wheels were his life. But this past August, while bicycling on his usual morning route, Schenkman was struck and killed by a 25-year-old man driving a Chevrolet Impala on Northern Boulevard, a bike lane-free street that’s been flagged as one of the most dangerous ones for cyclists by traffic safety advocates. Schenkman was riding eastbound near 223rd Street, a short distance from the Cross Island Parkway bike trail in Bayside, when he was fatally struck in the left lane as the driver was going the same direction. As pointed out by Gothamist, Schenkman was the 16th cycling fatality in 2016, surpassing the 15 that occurred in 2015. While the article addressed possible explanations for the rise in cyclist deaths, such as a lack of implementation of street redesigns and protected bike lanes, the comments section of the piece echoed cynical sentiments that cyclists often face. “They should really be more careful! Its dangerous out there, bike riders! Follow traffic rules and keep an eye out for people in cars and trucks!” read the first comment. Comments sections tend to be breeding grounds for harsh discourse, but this one exemplified the victim-blaming reality that pedestrians and cyclist commonly receive when it comes to crashes. When we hear about traffic crashes, there’s a tendency to question the intentions of the victim first and immediately put fault on them, instead of a reckless driver. This can be seen in the press when crashes are referred to as accidents, a word that activists have been fighting to demolish in reports because it implies that crashes are unavoidable, and reinforces the idea that no one is at fault. In fact, studies have shown that crashes are overwhelming caused by human error—including speeding, distractive or drunk driving—and not vehicle malfunctions. “Ninety-four percent of crashes can be tied back to a human choice or error. Ninety-four percent!” Mark Rosekind, administrator of the National Highway Traffic Safety Administration, told NPR. That doesn’t mean that drivers are getting into their cars with the intention of hitting others, but accountability is important, especially when thousands are injured in traffic crashes in New York City alone. According to city crash data, there were 4,317 total crashes in January, and 10 New Yorkers were killed in traffic the first 10 days of 2017. We’ve become so inured to crash fatalities that it’s become an expected part of life. In New York City, we’re quick to call a bicyclist reckless just for riding in the street, but accept hazardous, outdated streets and heedless driving as a way of life. This reflects a larger cultural attitude that prioritizes vehicles over bikes or pedestrians, which results in this acceptance of human error. These measures are part of traffic safety initiative known as Vision Zero, a multi-national road safety project, which was pioneered in Sweden and adopted by Mayor Bill de Blasio in 2014. It aims to eliminate all traffic deaths and injuries through new street designs that improve safety, along with expanded enforcement against road violations. Vision Zero has proven to work. New York City recently saw its third declining year of traffic fatalities, as de Blasio reported a record low of 229 traffic deaths in 2016. And last month, the mayor also revealed a $400 million budget expansion over the next five years for Vision Zero, a hopeful reassurance of improved streets and more safety measures. But 2016 also saw an increase in both cyclist and pedestrian fatalities, along with rising hit-and-runs; numbers that activists say are going in the wrong direction. “There’s really not a lot to celebrate in the numbers [of 2016], no matter how you slice and dice it and report the data,” says White. “That really speaks to the citywide increase in bicycling and the lack of infrastructure that we’re seeing, particularly in the boroughs,” as he explained that cases of cyclist fatalities tend to happen on streets without protected bike lanes. He also cited factors such as more commercial trucks on the streets as a contributor to crashes—a tragic coincidence with economic growth is the rise in traffic fatalities. A common complaint from New Yorkers is that bike lanes reduce parking and interfere with travel, but a 2014 report from the Department of Transportation found that bike lanes actually improved travel time while also reducing crashes, injuries, and fatalities. And bicyclists and walking pedestrians have every right to their share of the streets. New Yorkers are famously known as avid walkers, and the DOT also found that New York City has experienced a tremendous growth in cycling the past two decades. In a cycling trend report released last month, Manhattan saw a 98 percent growth in bike commuting between 2010 and 2015, while Brooklyn saw 83 percent increase and 59 percent increase for Queens. And 25 percent of adult New Yorkers rode a bike at least once in the past year. And while city streets have plenty of jaywalkers and traffic law-breaking cyclists, White says that the data, and in the cases of injuries and fatalities, have pointed to drivers as the ones who were breaking the law. “New York City is still a vehicle-centric city even though there’s no need for it to be,” adds Peter Schenkman, who’s also the executive vice president for automotive manufacturers Karsan USA and previously served on the NYC Taxi and Limousine Commission. 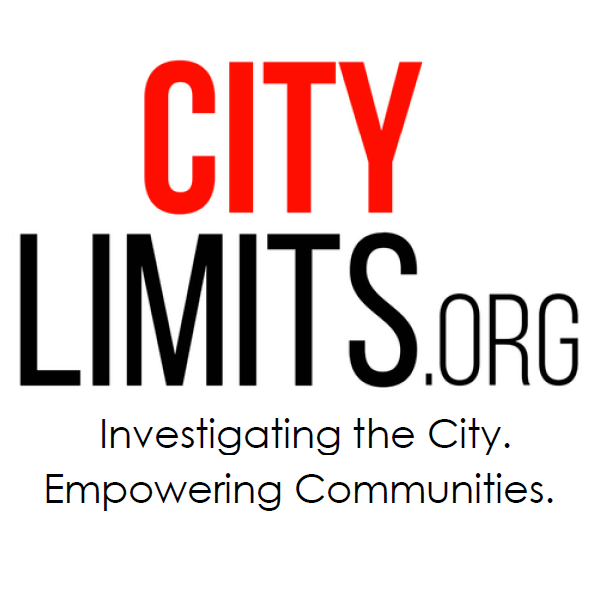 City Limits has published commentary on NYPD’s failures with Vision Zero before, the authors arguing that the police have routinely targeted enforcement against pedestrians and cyclists—even though NYPD data shows that drivers’ actions are the cause for fatal crashes and serious injuries—especially in communities of color. Peter Schenkman says he was unhappy with the police investigation of his father’s death and felt that his father was being blamed, despite him obeying traffic laws. He says a detective on the case claimed his father shouldn’t have been at the left light, and that it was declared an accident due to sun glare, a conclusion of which Peter Schenkman is doubtful. “It’s easier for the cops or detectives to blame the pedestrian, who might have been a split-second off, than it is to go through the hassle of an accident recreation,” he added. When the police take the driver out of the equation in a crash, they’re acting out the vehicle prioritization that is embedded in our culture, and also ensuring a lack of enforcement. In their reporting on those investigative conclusions, the press also becomes accountable for victim blaming. Such as the case in death of cyclist Lauren Davis, who the NYPD initially told reporters was riding against the traffic when a driver hit her. A witness, who insisted Davis was riding the correct way and that the driver failed to yield during a turn, went on to debunk the claim. And having a lack of accountability can also factor in hit-and-runs, which have continued to surge and result in a majority of drivers getting away with the crime. Councilman Ydanis Rodríguez hopes to combat these issues with proposed bills including one for an Amber Alert-style system for drivers who hit and flee the scene, and a fund that rewards up to $1,000 to people who provide information that leads to the arrest of a hit-and-run driver. Not only would these measure encourage witnesses to stay on the scene and come forward with information, they would also reinforce the idea hit-and-runs are unacceptable. As human beings, we are subjected to errors. But that does not excuse preventable actions, such as speeding or distracted driving, and it definitely does not justify hitting and leaving someone for dead. Vision Zero works, but only when we get past these damaging notions that affect enforcement, create resistance to new street infrastructure, and subsequently lead to more deaths. And even if it’s impossible to reach zero fatalities, shouldn’t we strive to achieve the closest number as possible? It’s understandable to have grievances about lack of parking in a crowded city, but we need to also see injustice when New Yorkers are being killed or seriously injured in traffic everyday. Accountability is way overdue. Lisa Brown is a freelance journalist. I’ll take your folks more seriously when you speak up against bikers who don’t lights and reflectors. There are an amazing number of invisible bikers out there and they do have a responsibility. It appears based on your comment you did not fully comprehend the information presented in the article. The article articulates the notion of how bicycle and pedestrian (walking) related deaths as a result of negligent driving by the motor vechile operator, are often not investigated further or prosecuted, often leaving the bicyclist or pedestrian with the blame and therefore no accountability from a criminal or civil law standpoint of the negligent motor vechile operator, or even the notion to investigate these events further, which is the basis for the article. David Sucher I will take your comment more seriously after you read the article. A sidebar on trucking: oversized trucks (53′ plus) are not allowed on City streets unless they get a special permit from DoT, and are making a single drop/pickup. The “improved economy” be damned: jobs would increase if the NYS traffic laws were enforced! Hmm: “a reckless driver”. Interesting choice of words, in an article which seems to be admonishing us against blindly assigning blame for crashes on a specific group of people without knowing the facts. Yes, let’s remember that the blame can go either way. Bike riders or pedestrians should not be presumed to be guilty, but neither should motorists. Every crash should be carefully analyzed as to its cause or causes. This idea that I am guilty because I am driving a two-ton machine needs to go away, and the actual legality of the actions needs to be analyzed, along with answering the question: Could either or both of the parties have prevented the crash? Vision Zero is a noble idea, but proponents over-simplify the situation and presume every crash is a result of speed. It just ain’t so! And, the stress on speed reduction needs to be replaced by a shotgun approach that utilizes every possible means of preventing crashes, starting with those that don’t interfere with driving (or biking for that matter). I’ll certainly agree that some motorists speed even to the point of crazy, and do other crazy things. But, the biking community that is so enthusiastically for Vision Zero needs to realize it views the automobile and its drivers in a harsh, negative way that is deserved ONLY by a minority. Instead of Vision Zero proponents on one side and drivers on the other, we need to search for even-handed solutions that will benefit all stakeholders, accomplishing safety goals while maintaining walkability, bike ridability, and drivability to the extent possible. That means slowing some drivers down but not all, and substituting intelligent road design and selective, accurate enforcement for draconian methods like eliminating driving lanes needed for reasonably free traffic flow at busier times. Amid a struggle for Puerto Rican independence that has spanned three centuries, a police commissioner’s decision not to march in the annual parade is small potatoes. Imagine a world where a federal judge has to tell civil liberties lawyers that they’ve conceded too much to the NYPD. Don’t imagine it. You’re living in it.